The Workshop module manages the repair and servicing of equipment by technicians. Workshop jobs may be Manufacturer Service jobs, Chargeable Repairs or Warranty Work which is billed to the manufacturer. The module manages the life cycle of each job from taking a booking through to completion and invoicing, including sub-contracting specialist repair work within the job. 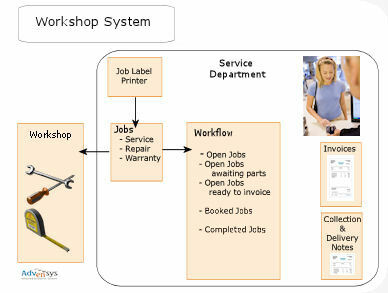 A dedicated workflow is provided for workshop jobs which clearly shows the jobs by their stage, booked, open or completed. A single click will display all known information about the job.